The Baldwin County School Board of Education has a Special Board Meeting scheduled at 8:00 AM, June 1, 2010. They presumably will select their new Superintendent at that time. Click here for District web page where the agenda may be posted once the meeting is completed. Today is Graduation Day ! Congratulations to all the new Graduates and also to their proud families !! Enjoy your day ! Again, one of this blog's outstanding posters comes up with news from the Baldwin County School District Superintendent search. Thanks (again?) anon 11:34. Baldwin County school board members took about an hour to interview each finalist in the superintendent search this week, with both men up for the job proposing change and collaborative leadership for the system of 27,000 students. Lee faced the board for the second time on Monday, saying he might not have all the answers for Baldwin County, but he could "help people realize they have the answers, and I can guide the board and the people here to the best decisions." School board President Tracy Roberts asked Lee to "help me feel better about your coming from a system that seems very small at 7,800 compared to Baldwin County with 27,000." Lee said he would rely on experts that are most familiar with the system, make his expectations clear and work with all stakeholders to be sure the system reaches its goals. He said most of the concerns he had heard over the day could be solved through better communication between all involved. "Openness is the key to addressing issues," Lee said. "Nothing is sacred and everything is open for discussion and consideration." Lee said negotiating with state and even national leaders does not bother him, and he currently serves as the president of the State Superintendent's Association in Virginia. Lee said he advocates technical training for all students, and is very protective of art and music in education as well as professional development. Regarding cuts to the system's personnel, he said principals should always be involved in decisions that so drastically affect their schools. Lee said he would immediately create e-mail addresses for all county school employees, post the policy manual on the system's website, form advisory committees for schools, a planning team for the central office and begin learning the system's strengths and weaknesses. Stinson met with board members on Tuesday, proposing sweeping changes to the way students are educated. The Decatur system has about 7,000 students. reinventing education, making it customized for learners. We need to get in touch with our students. For so long we expected one size to fit all, and it simply does not work for 21st century students." Stinson implemented a system in Decatur that groups students according to interest in various areas like the arts, business, scientific research among other areas. Students remain in classes that infuse math, reading and other basic lessons as they relate to the learning community. The system also assigns an adult that mentors and tracks a student all through their school career. Stinson said leaders must "imagine you can start over from the ground up and design a system to meet our students' needs. What's needed? Can it become real based on the finances available? Unless you have a 100-percent graduation rate, 100-percent success-in-life rate for your students -- you need change." He said leaders must change their beliefs about education, and reaching that point "is almost a spiritual experience." Change in Decatur meant implementing the small communities concept, and opening technology use like cell phones for project research. He said the changes took parts of successful systems across the country and created the Decatur model. Stinson complimented the county on its high test scores and the open interview process. He said he plans to mold new leadership in the system if given the chance, and would begin the process of change by finding out what stakeholders want the system to become. Board members said both men were outstanding candidates, and that site visits to the out-of-state systems led by the finalists would be the last task before the Tuesday vote. I've gotten sidetracked on some other things. So, thought I'd just jot a note with a mere pleasantry. I don't know if you've run into www.restaurant.com before, but they are a pretty good way to stretch your dining dollar. They offer mostly $10 or $25 off dining certificates (some conditions apply, so look for those) for just a couple of dollars. At the end of every month they send out an email to their members (free memberships) with promo codes to use at checkout that reduce the cost even more. So, right now, a $25 off dining certificate that costs $10 most of the month, costs only $2 when you use the promo code "flag" when you are ready to pay for your certificates. The certificates are good for a full year from date of purchase and are very easy to use. More and more Indy area restaurants are getting listed, so the selection could include a place you would have gone to anyway. We don't go out to dinner very often, but I always look through the restaurant.com list to see if a place we want to go to is there. And certainly when we are going on vacation, I check to see what locations are offered in those other cities. Just one other caution, when you are trying to check out, they offer one of those crazy 'click here for free whatevers' -- but when you do, that site asks for way too much personal information. So, my advice is to avoid those offers -- just scroll all the way down the checkout page and click on the link that says something like 'no thanks, I'd just like to check out now'. If you have any websites that offer good savings on stuff you'd like to suggest, post it here. An alert contributor to the "New Maps Posted On Decatur Website", anonymous 2:27, gave us the news that one of the 3 finalists vying for the Superintendent post in the Baldwin County School district (Mobile, Alabama), dropped out, leaving only Don Stinson and Alan Lee. Thanks anon 2:27 ! You can read the entire article from the Mobile Press-Register website aI.com. The decision leaves Alan Lee, superintendent of Washington County Public Schools in Abingdon, Va., and Donald Stinson, superintendent of Decatur Township in Indianapolis, left for consideration. Lee will interview with the BOE May 24 at 6:30 p.m., and Stinson will interview May 25 at 6:30 p.m. The Board hopes to name a new superintendent by June 1 to take office by July 1. I just received copies of two notices of public hearing for Proposal 132 from Melissa Thompson, clerk of the Council office, on behalf of 'President Vaughn'. These notices were published on April 28, 2010, in the Indianapolis Star and the Court & Criminal Record. Both are signed by City Controller, David Reynolds. Having a subscription only to the Star, I guess I need to spend more time reading all that tiny print, instead of relying upon the word of the Council President or the accuracy of his agenda. My bad. Last night the City-County Council voted on Proposal 131 - giving the Ballard Administration permission to continue to craft a final agreement to sell the water and sewer utilities to Citizens Energy - and Proposal 132 - which raises the Payment in Lieu of Taxes paid by the sewer utility and floats $170 million in bonds secured with that increase in PILOT. Here is how the individual Councillors voted. Proposal 132 -- same vote as above except that Libertarian Coleman changed positions. Why Does the Republican Caucus Want Ryan Vaughn ? With the changing demographics in Marion County, this could be the very last Republican majority in the Council. Given that possibility, why on earth would the Republican caucus ever want Ryan Vaughn to be their President? In case you missed it, last night the Council voted in favor of Prop 132, which will immediately raise sewer utility rates to pay for a $170 million bond. IF all goes as promised (promises that were denied legitimacy because they were not written requirements of the Proposal) then this will be the biggest reelection slush fund in the history of Indianapolis. Utility ratepayers will immediately begin to see increased bills to finance $135 million in unnamed projects, paying an additional $157 million in fees and interest over 30 years for projects that do not have a useful life anywhere near that long. But, they can spend it any way they want to. Need a moving sidewalk in time for the Superbowl? I know where there is some money. Need a boost to the reelection of a favorite Republican incumbent? I know where there is some money we can spend in his district. Pacers or the ICVA or the CIB or the convention center need some more dough? I know where there are $135 million smackaroos that can be spent without regard to small matters like promises that weren't guaranteed in writing. Back to Ryan Vaughn. Councillor Vaughn is clearly ambitious. And not in a good way. Upon getting elected, he traded up employers to a job at Barnes & Thornburg. When the Republicans were swept back into control of the Council, he tried to become President of that body, without anything, even a committee chairmanship, to recommend him. Then, when there was an opening at the Indiana Senate, he tried to get appointed to that post - because it was better than being just a Councillor. Finally, his caucus granted his wish and he was elected President of the Council in January. This Ryan Vaughn is a man who likes to pull out his portable soapbox and lecture others about ethics, fiscal responsibility, and the law. This Ryan Vaughn doesn't care about ethics when it serves him to ignore the ones that should apply to himself. He consistently refuses to recuse himself from votes that affect B&T and their clients. This is why, after all, he was hired by B&T. When he uses the word 'we', he refers to the Grand-Loftus Administration, and not the Council. Ryan Vaughn doesn't care about fiscal responsibility and keeping promises. This reelection slush fund, which will see even more money when he pushes through the sale of the water and sewer utilities, is fiscally unsound ten ways to Sunday. Getting a 30 year loan to pay for projects with shorter useful lives is not prudent fiscal policy. Paying over $1 for just 50 cents of work, is not prudent fiscal policy. Just the same sort of misguided fiscal policy Ryan Vaughn used to pull out his soapbox and lecture the Peterson Administration about. Proposal 132 specifically says that the funds can be used for anything for which money from the County General Fund can legally be spent. No tying the promises to the deeds in this Administration and no problem for Ryan Vaughn who lectures the public each time a budget hearing comes around about what vapid promises look like. And last night saw the apex of Ryan Vaughn's approach to power -- ignore the law if it is inconvenient. Proposal 132 appropriated the funds to be generated by the $170 million bond. Several of us at the Marion County Alliance of Neighborhood Associations (who have not had any input regarding this blog entry) talked about going down to the Council hearing, as it seemed like it should be a public hearing because Prop 132 involved an appropriation of funds. The agenda indicated it was not a public hearing. So, Cathy Burton, President of McANA, inquired directly of Councillor Vaughn. No, it is not a public hearing, was Vaughn's reply. So, I guess that means he is a lousy lawyer to boot. Because it was required to be a public hearing. Only, the public did not get its 48 hour notice of the hearing and when specific inquiry was made, they were told the wrong thing. Did that stop Ryan Vaughn from pushing through to the vote? Did he do the right (as in legally clear and ethical) thing and table the Proposal so that the legally required notice could be afforded to the public? Hell no ! It was inconvenient to abide by the law, so he chose not to. So, why does the Republican caucus want Ryan Vaughn to be their President? What on earth do they see in him that says he is the cream of their crop? I can think of numerous others in that caucus who would hold themselves to higher standards of conduct. Just last week, at Tuesday's Rules committee meeting, Councillor Vaughn's impatience with having to actually hear the other side's comments and concerns, was liberally on display; culminating with his childishly storming out of the meeting just after the vote and before the meeting was actually over. All the other Councillors managed to stay in their seats until the meeting was gavelled to a close. Yes, he got the reelection slush fund through. Yes, there will be appeals for its use for all the shiny toys that are the sports teams, the Superbowl, the CIB and ICVA -- and spending the money on those things will be perfectly legal. But, others could have accomplished the same and without the ethical cloud, without the pious lecturing, without the cry baby demeanor, and without breaking the law. What am I missing? Why does the Republican caucus want Ryan Vaughn to be their leader? Monday night the Indianapolis-Marion County City-County Council will decide the fate of Proposal 132, which authorizes an increase in the sewer utility PILOT (Payment in Lieu of Taxes), authorizes issuance of a $170 million bond to be repaid with these PILOT payments over 30 years, and appropriates the bond proceeds to be spent on projects approved by the Public Works Board. Whether one is in favor of generating money for infrastructure needs through increase utility rates - whether one is in favor of selling the City's water and sewer utility - extreme caution should accompany any consideration of passage of this Proposal as it does a disservice to the long term interests of the City's taxpayers, ratepayers, and myriad property taxing units. Let's start with the PILOT itself. I learned just two days ago, at a meeting set up by Councillor Christine Scales between local bloggers and representatives of Citizens Energy, that Citizens Energy pays property taxes. It does so for the property assets of its current utilities, and would do so for the water utility, should they take ownership of that utility. But, the PILOT envisioned in Prop 132 will be substituted for any property tax liability Citizens Energy would have regarding the sewer utility, should they take ownership of it. The questions are: by what statute does the City have the authority to replace the property tax liability of any organization and substitute a PILOT? How much would Citizens Energy have paid in property taxes over the next 30 years, should they take ownership of the sewer utility? How much revenue do the other property taxing units in Marion County stand to lose if the PILOT goes through and they do not get property tax revenue for the sewer utility? The PILOTs I have heard of before now were assessed to organizations that normally do not pay property taxes; the airport and the CIB come to mind. The important difference between a PILOT and property taxes is that the City gets the entire PILOT amount, but property taxes are shared among all taxing units relevant to the property location. Usually, schools get about half, the City/County government nabs about one fifth to one fourth, the municipal corporations (Health & Hospitals, Library, and IndyGo) get about one tenth, and the Township Government gets the rest. So, should the City swap out property tax liability for a PILOT, which it is still unclear to me they have the authority to do, it takes money from Marion County schools, Townships, the library, IndyGo, and Health & Hospitals. Chris Cotterill, Mayor Ballard's Chief of Staff, tells me that IC 36-3-2 and 8-1-11.1 exclude the sewer utility even if Citizens owns it. Hopefully the lawyers will hash this out more fully. But, what I see is that IC 36-3-2 begins with the premise that "That the tax base of the consolidated city and the county have been significantly eroded through the ownership of tangible property by separate municipal corporations and other public entities that operate as private enterprises yet are exempt or whose property is exempt from property taxation." Since Citizens Energy pays property taxes on its currently owned utilities and would do so if it were to own the water utility, it certainly seems like, at best, a huge loophole to forgive them property taxes on the sewer utility -- thereby getting ALL the tax money for the City and denying other taxing units their due. Another problem with Prop 132 is that it envisions floating a bond that will take 30 years and cost $292.5 million to repay (see this report in the 'library'). From that money, only $135 million will be generated to spend on infrastructure projects (if indeed the money actually gets spent on such things and only such things). These projects do not have a useful life of 30 years - much less in fact. It is a pretty simply tenet, you don't get a loan for a longer term than the life of the article which you would purchase with the loan. So, the bottom line is that the sewer utility ratepayers would pay $135 million in principle and $157.5 million in interest and fees over 30 years for repairs and construction which will not last for 30 years. If we went by the more prudent, pay as you go system, the PILOT would generate the $135 million by year 14 (2023) and the remaining years through 2039 would see it generate over $280 million. The final critical problem with Prop 132 is that the funds generated are not dedicated to the projects which have been promised. Section 29 of the Proposal states clearly: "All PILOT received by the City shall be deposited in the consolidated county fund and used for any purpose that the consolidated county fund may be used." So, the money can be re-appropriated and used for pretty much anything. In addition the PILOT is anticipated to generate about $123 million MORE over 30 years than is needed to repay the bonds. Yes, I'm sure the City could find many things to spend this money on. But Mayor Ballard continues to promise infrastructure improvements and the administration and the Council should be making sure that all of the proceeds of this deal are dedicated to fulfill their promises. And if they do not dedidate the funds, then there is no taxpayer or ratepayer in Marion County who should believe the promises. As the saying goes, they won't be worth the paper they aren't written on. There are several BIG problems with Prop 132 - swapping a PILOT for property taxes denies other taxing units their due revenue, paying on what is basically a loan over 30 years for things whose tangible life is far less than 30 years, having ratepayers pay more for interest and fees than for promised projects, and not backing up the promises by dedicating the money for the promised projects in writing. All of these should lead to a Council vote against Prop 132. In response to an open records request, Gary Pellico provided me with the list of previously RIFed teachers who were recalled at Tuesday night's MSD Decatur School Board meeting. Those newly recalled, plus the 13 previously recalled (see "13 Teachers Recalled at MSD Decatur Township"), leave 21 teachers who remain on the RIF list. Given the back flips families will be doing to get their children to school, many of whom will not be able to attend the closest school, the issue of finding new babysitters has been brought to my attention. I have been asked to allow babysitters to post their names and what school district they serve. Given that any entry in a blog rolls down and finally off the main page, I think what might be best is for babysitters to contact me at hadenoughindy@gmail.com with their name, phone number, and what district they serve. I will then post it in a box on the right hand side of the blog. This will not be any kind of endorsement of the particular babysitters -- so do your homework and get your references. The City-County Council Rules and Public Policy committee will be meeting tonight to vote on Prop 131 and Prop 132, which involve the proposes sale of the water and sewer utilities and floating an $189 million bond, respectively. The meeting is scheduled for 5:30 pm in room 260 of the City-County Building. The Rules committee has amended Prop 131 to require that the final version of the actual sales deal come back before the Council for final approval. This is an excellent move and rightly values the Council as an independent arm of City government. There are 4 fundamental issues regarding the sale of the water and sewer utilities to Citizen Energy, that I think are most important. 1) DEDICATION OF FUNDS: The proceeds from the sale (Prop 131) and the increased sewer utility PILOT (Prop 132) are not dedicated to street and sidewalk repair and installation. From what I hear, the Mayor's office is willing to look at inking down exactly how the money can be spent, but some on the Council want to leave it loose in case a future Council wants to spend it otherwise. We heard verbal promises by the Republican Council and Democrat Mayor, Bart Peterson, on the first stormwater drainage fee that appears on property tax bills. The promise was that the funds would be used to finance new drainage projects, something the City had been unable to find the funds to do previously. Instead, the money went to pay off old debt for old projects and the money that had been budgeted for those debt payments went elsewhere in the City's budget. So, lots of verbal promises, but no written commitment on how the money could be spent. We heard verbal promises by the Democrat Council and the Democrat Mayor, Bart Peterson, on the increase in County Option Income Tax, $5 million of which was promised to go to crime prevention grants. While some money has been so spent, the verbal promise was put to the side by the Republican Council that was voted into office in 2007. Now-President of the Council, Ryan Vaughn, and Councillor Ben Hunter, have been the most vocal about the fact that the old Council did not ink down the promise properly and that is why a) they voted against it originally, and b) why they did not feel bound by the promise. Vaughn, Hunter, and others, are now in the position of voting for or against a proposal of a Republican Mayor, Greg Ballard, who has made verbal promises all over the County regarding how the proceeds from any sale would be (and would not be) spent. They have it within their power to commit to the promises being made. It is now their watch. The Council is up for election next year. The Council could again pass to Democrat control and out of the control of Vaughn, Hunter, and Ballard. If they mean what they say, they will commit to it in writing. This is as true of the spending of the proceeds of the bonds that would be backed by the increased sewer utility PILOT payments, as it is of the proceeds of any sale of the water and sewer utilities. 2) LOCAL PUBLIC INPUT: To move all oversight and public input to the state level for a local service is not wise. That is what they did with the oversight of the cable companies - and that has not worked out well at all for the customers. The Indiana Utility Regulatory Commission has shown itself to be best buds with the utilities they regulate. Marion County residents deserve a local say in a local public process, about local rate hikes and local expenditures. It is, after all, the public's water and sewer utility right now, and it is in their interest that they not be cut out of further issues that will arise. Mayor Ballard has said the one of the express reasons to sell the water and sewer utilities is because politicians don't have the stomach for raising rates. Well, that's not all bad. And, if you go in that direction, at least leave the regular citizens with a process where they can HOPE to influence the outcome of rate appeals that will pull more money from their pockets. 3) RAISING WATER/SEWER RATES INSTEAD OF TAXES: There is a fundamental question involved in all of this - should water/sewer customers pay for their water and sewer usage AND fund street and sidewalk improvements? There is no doubt that there is much need for infrastructure improvements in Indy. But, how to get the money to do it all quickly, is another matter. If the proceeds from the sale are not dedicated specifically to a very short list of possible types of expenditures - then why would anyone agree to increased water and sewer rates? If the funds were to be dedicated, in writing before any deal is finalized, then this question still remains on the table, in my view. I have to admit, I end up on both sides of this one, depending upon how I approach the question in my mind. If I look first at the huge need for street, sidewalk, and bridge repair and then at the issue of passing the cost onto water and sewer utility customers, I can see a scenario where I could support it. First, the money would have to be dedicated or its off the table for me. Second, there needs to be local oversight of water/sewer utility in the area of protecting our water supply - both in quality and quantity. Not widely know, I think, is that the water company has been pumping water so rapidly from the Perry aquifer, that the underground flow of water into the aquifer has not been able to keep up. The water table has dropped 10 feet as a consequence. This is not trivial. Likewise, overpumping from reservoirs and inadequate water release into our rivers and streams can lead to damage to those biomes. Luckily, the City will retain the Eagle Creek reservoir, considering it a drainage control feature, and not primarily a drinking water supply. But, not all of the rivers and streams in the County can have their water levels increased or decreased by opening and closing the Eagle Creek dam. When I come at this question from this angle, I conclude 'maybe - if there are some other ingredients secured'. If I look at the water/sewer rate payers first, then the need for infrastructure improvements, I land on the other side of the equation. These rates are going to go up -- way up. Just because the City projects the rate to go up less rapidly if Citizens runs these utilities, the rates are still going way up. There is something positive to be said about keeping the cost of living as low as possible. There are economic and social reasons to do so. This is not a trivial matter. The proponents of the sale are saying it is important to keep rates as low as possible - so sell the utilities. But, then they say - since there are savings, lets split the difference. When I come at this question from this angle, I conclude 'no' to utility rate payers paying for ANYTHING more than the water and sewer they use. 4) CLEAN, SAFE, DRINKING WATER IS OUR NUMBER ONE RESOURCE: This is the most fundamental point of all. Our area spends much of its resources trying to get rid of excess water - especially this time of year. But, that should not lessen the value of clean drinking water to us. I would recommend folks look over the April issue of National Geographic before coming to a conclusion on this point. "Water - Our Thirsty World" is the title. They go into the perspective in other parts of our Country and the world. Some of the titles of articles in this volume: "Water is Life", "The Burden of Thirst", "California's Pipe Dream", and "The Last Drop". I can't conclude that the City should give up its ownership of this resource. Run the utilities better, sure. Give up ownership of the water? No - I cannot go there. Tonight the Rules committee will decide on whether to recommend the full Council pass the increased PILOT from the sewer utility and approve floating the bonds that would be repaid with that money, as well as approve the Mayor and Citizens continued resolution of the details of the sale with the proviso that the Council gets a say after seeing said deal. This very well may be the most important decision that this Council makes its entire term. Again, the meeting starts at 5:30 in room 260. Since public testimony was taken last week, there may not be any additional time for comments made available. Channel 16, as always, will carry it. The MSD Decatur Township School Board will meet tomorrow, May 12, in Executive Session at 5:00 pm and at its Regular Meeting beginning at 7:00 pm in the Board Room of the Central Office. The meeting page of the district website has been revamped. To get to an agenda you click on the date in the right hand panel. Or just click here for tomorrow's agenda. It is not clear how many are action items, except A. The DEA, the Teachers Union, is presenting the new contract to its members this afternoon. I'll post the changes from the old contract here as soon as I can. As for the recall of teachers, it isn't clear if this is the official notice of the previous recall of the 13 teachers, which has not yet been voted on by the Board, or word of additional recalls afforded by any agreement with the DEA and the potential savings from subletting space in the Mitchell Building to the new Charter school revolving around aviation. "One who purposely and deliberately (that purpose usually being self-amusement) starts an argument in a manner which attacks others on a forum without in any way listening to the arguments proposed by his or her peers. He will spark of such an argument via the use of ad hominem attacks (i.e. 'you're nothing but a fanboy' is a popular phrase) with no substance or relevence to back them up as well as straw man arguments, which he uses to simply avoid addressing the essence of the issue." With the Sitemeter function linked to this blog, I can get limited information about the visitors. anon 7:04 who commented on "Moving On", logged on from Indianapolis and was on for all of 49 seconds. They visited the main blog page and this entry's comment page only. Obviously, not enough time to even read that blog entry itself. Only enough time to type up his or her personal attack and leave. anon 7:04 is typical of the trolls that have begun in ernest here. Since you actually read at least some of the information here, let me say this - education is the most important thing to our community, as it is to every other community in Indiana. Roughly half of our tax money goes to K-12 education in this state - local tax dollars as well as state tax dollars. Those tax dollars should be used for the purpose of education. Not to build palaces. Not to make Administrators millionaires. The Indiana State budget for 2009 spent $6,169,000,000 (over $6 billion with a 'B') on K-12 education out of a total budget of $14,436,000,000 (over $14 billion with a 'B'). For 2010, the budget appropriates $7,579,000,000 for K-12 education out of a total budget of $14,331,000,000; actually increased spending on K-12 education with a decreasing overall budget. It is also important to remember that school districts are governmental units overseen (or supposed to be overseen) by elected representatives of the people. The public deserves open meetings where they can 1) tell what is being discussed and 2) participate by offering their opinion on matters before the Board. The public elects these Board members to review, think, give input, think again, and then vote up or down on fiscal as well as personnel matters - policy matters - and a whole host of things. But, not to be a rubber stamp. A rubber stamp is as good as not having a Board Member at all. Maybe worse. Education in Indiana is serious business. Each and every community should be taking a close look to see that the money is not being squandered in ways that enrich adults but do nothing to improve or deliver education to the children in the MOST EFFECTIVE WAYS FOR THE CHILDREN. I used all caps there, because it certainly is my opinion, having seen a district operate up close, that many of the expenditures are most effective for the adults and not for the education of the children. Anyway - if the public does not become more engaged in education during this time of fiscal constraint in all districts and fiscal fiasco in Decatur's, then there may be no hope for really improving the quality of education and thereby providing today's children with more secure futures. Trolls represent a segment of our population - those who want everything to run smoothly so they don't have to be pulled away from their everyday routine, and lacking that, they want everything to SEEM to run smoothly so they don't have to be pulled away from their everyday routine. In addition, all people want to be able to trust those who make decisions every day that will affect their children, their children's education, and thereby their children's future. To shake that confidence has its consequences. But, if all the money we pour into education is allowed to be frittered away not to the benefit of education itself, and if we are not willing to call it out when we see such frittering, then we waste our money and the children's future. Happy Mother's Day to all you Mothers out there. Hope you are having a great day with your family. Time for another free-for-all. Anything on your mind that you want to address? Otherwise, its a beautiful day to be outside. The unofficial precinct by precinct vote tally from Tuesday's Primary Election are posted on the Election Board website. Thanks for this tip from yet another alert commenter to this blog. The Indy Star is reporting that a newly organized Charter School that revolves around the theme of aerospace, will be subletting space in the Mitchell Building left empty by the departure of the Decatur Discovery Academy (DDA). Although the Decatur School Board has not yet voted on the matter, does anyone expect any 'no' votes at any time, whether they are warranted by good sense or not? In this case it does make sense. As background, the Decatur Schools district entered into a long term lease for space in the Mitchell Building; some of the space to be for the DDA. The lease agreement is in effect until 2013. [edited on 5-8-10 : the lease agreement is actually in effect until June 30, 2016] As noted back in January, the blog entry "The Mitchell Building Drains Funds From Decatur School District", the DDA space alone costs the district $265,501 a year. There is no mention in either the Indy Star article, nor on the IndyGov Charter Schools webpages about any terms of the sublet. Star reporter, Gretchen Becker, notes in her article that the new charter will slowly increase the number of grades served. "Our goal is to become one of the outstanding academic schools in the United States," said Roger Tomey, a pilot and the school's executive director. "We want to make sure when they get accepted to a university that they get that degree." The school will start with seventh-graders when it opens Aug. 2. It will add a grade level each year up through 12th grade, said Principal Marie Theobald. The rigorous curriculum focusing on reading comprehension, as well as critical and analytical thinking skills, will start at the middle school level to prepare students for intensive science, technology and math courses as well as college-credit opportunities, Theobald said. As soon as the legal paperwork is completed, the School Board should vote on the issue, Pellico said. Indiana Aerospace Jr./Sr. High School has an educational model unlike any other in the state of Indiana. The model infuses aviation and aerospace themes into a rigorous science, technology, engineering, and mathematics curriculum. All students will complete a Core 40 with Academic Honors curriculum. The curriculum will provide students the opportunity to engage in multidisciplinary projects, enroll in dual-credit classes with Vincennes University, Purdue University and Indiana State University, and work in internships with local aerospace industry firms. Upon graduating, students will each total more than 300 hours of shadow experiences and internships with local aerospace industry firms, giving them vital hands-on experience and knowledge prior to furthering their education at the post-secondary level. As you can see, this new charter is not affiliated with MSD Decatur Township schools and their Administrators. That is definitely a plus for them. Their sublet of the DDA space will help the district financially and could save roughly 5 RIFed teacher positions. We shall see how the Administration actually apportions the savings. A comment left in the last blog entry mentioned that the MSD Decatur Township Central Office threw themselves a celebration yesterday. Well, I can tell you that the community is not celebrating. These folks who come here to work at wages higher than the Mayor, the Governor, Senators, Congressmen, and in some cases, the President of the United States, with the exception of one administrator, do not wish to actually live within the community that pays their stupendous salaries. Again with the exception of one administrator, they do not wish to educate their children in the very schools they pretend have improved substantially and with which they want our community's parents to be satisfied. The information posted on this blog is from public documents from the Indiana Department of Local Government Finance, the Indiana Department of Education, the Indiana State Board of Accounts, and even from the MSD Decatur Township, itself. The truth is that this Board and Administration have dug us into a financial hole due to their buying and spending spree. The truth is that this Board and Administration have not improved education in our schools, and the data suggests that our district has slid downward over the same years that the state averages have climbed upward. This information needs to be seen by more of our community, and over time that will happen. Further information will continue to be posted here. Parents will soon find out what schools their children will attend in the fall. Next school year, transportation will be a nightmare. Next year, because of this Board and this Administration's profligate spending, and its application of a budget cutting plan that impacts the classroom first and hardest of all, class sizes will rise - the very worst thing you can do because of its effect on education. The next worst thing you can do is bar elementary children from attending their neighborhood school - which is going to happen on a large scale. And, right now, bus drivers are being badly treated, teachers are needlessly being laid off with little chance of getting another teaching job in this economic climate, closing down the security department is back on the table, and the custodians continue to be mistreated. The folks with the huge salaries, the administrators, have taken a tiny tiny hit in number of positions lost and salary reduction. The further you get from the classroom, the smaller the impact of the budget cuts - the plan is to make the cuts as painful to the community as possible and as pain free to the Central Office as possible. Right is right and wrong is wrong. They will continue to spread lies about anyone who dares challenge them. They will threaten the job of any employee who steps out of line. The election gave us all a surprise ending. Today we pick up, dust off, and move on from that focal point. But, this blog will continue to post the facts about the Decatur School District and the caliber of jobs the Board and Administration are really doing. The Decatur School Board incumbents all won reelection. Wiseman was unopposed in District 1. At this moment the Election Board website is reporting that of 16 of 17 precincts (there are 15 in Decatur and 2 in the North District) in, Wiseman got 1408 votes. Collins 876 -- Henson 804-- Hire 737 and Coffey 734 in District 3. Pretty close numbers and my bet is that name recognition brought it home for the incumbents. Today we go to the polls and vote. Let's be respectful, today of all days, that Americans get to disagree. We will make known the will of the people in each vote cast and counted today. Here is the day when Decaturites will decide on who will represent them on the School Board. Let's be respectful of each other's fundamental right to form our own opinions. With that in mind, post your thoughts on the Election or whatever suits you. I will post a link here, to the Elections page of the Clerk's office. Last election they had a link to a live vote count that automatically updated and refreshed the visitor's view of the count as it was tallied. That link is not live at this moment, but, scroll down to "5/4/10 Primary" and right under that is "Election Results". That might be where the hot link to the vote count will be. Hoping that is so, here is the link to the main Election page: click here. Now, go out and VOTE !!!! The 2010 School Board Election will be held tomorrow, Tuesday, May 4, along with the 2010 Primary Election. All registered voters may choose to declare a Party affiliation OR NOT. You can vote for School Board only, if you wish. If you declare a Party affiliation, you will be given a ballot with the Party races on one side, and the School Board races on the other. Remember to turn the ballot over and vote on the School Board race. If you don't want to declare a Party affiliation, just ask for the School Board ballot. That is printed only on one side. 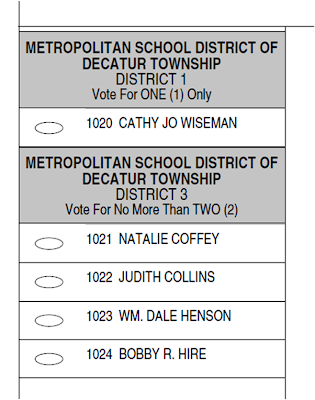 If you live in Decatur Township, you can vote for any of the School Board candidates, no matter what District they are running in. They must live in the particular District, but the voters can live anywhere in the Township. I would suggest, however, that even though you can vote for one candidate in District 1, that you leave that blank, as Cathy Wiseman is an incumbent and part of the problems we have with the rubber stamping Board. Since she is unopposed, unfortunately, she will be reelected as long as she remembers to vote for herself. In the District 2 race, it will come as no surprise that I suggest you vote for Natalie Coffey and Bobby Hire - the first and last names listed in that race. Everyone needs to get out and vote. 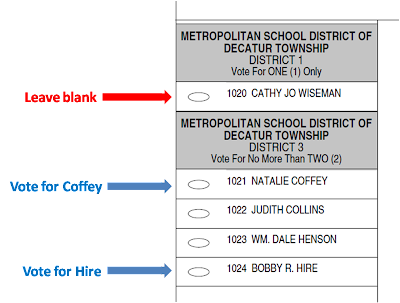 This School Board election is not about ensuring Coffey and Hire win - but rather about ensuring that Coffey and Hire win by the widest margin possible. This will send a clear message that the voters of Decatur Township are fed up and want substantial change in how the School Board and the School District operate. If you are unsure of where you vote, or if you would like to see the ballots available for your voting, you can log onto the Election Board "Voter Information Portal". You must put in your address and click "verify address", and then proceed to the information you would like to see. You can check to see if you are registered to vote by entering your birth date. Options available are to view sample ballots for your Precinct, view your voting location, get a map and directions to your voting location, and more. Its pretty cool. There is one day left to tell you friends, family, and neighbors about the mess that is the Decatur Township School Board. Urge them to get out and vote. You also remember to get out and vote. The polls open at 6:00 am and close at 6:00 pm. Lets all send a strong message tomorrow. See you at the polls. City Hall beat reporter, Francesca Jarosz, has another good article in today's IndyStar about the progress of the City's sale of the water and sewer utilities to Citizens Energy. Jarosz says that the issue will be taken up tonight by the Council's Rules and Public Policy Committee, Chaired by Bob Lutz. The meeting begins at 5:30 pm in Room 260 of the City-County Building. Instead of voting to give the Mayor authority to finalize the sale of the utilities, they will evidently modify Prop 131 to give the Mayor authority to continue moving forward with the deal. The actual Proposal on the actual sale will wait until June when the details have been crafted into a legal document. This is an important move by the Council; keeping alive their role as partners in Government along with the Mayor. They are refusing to rubber stamp a deal the details of which they have not seen. Good for them. agreed to move back the timetable after some council members raised concerns about having to vote before the city and Citizens reached a final agreement, which is expected in June. "It's an overwhelming proposition," said Joanne Sanders, the council's Democratic minority leader, who sent a letter to city officials asking that they allow the council to review the final agreement. "We'll be the ones who will be held accountable, and we have to make sure we do our due diligence in assessing whether this is the best deal for the citizens of Indianapolis." The Rules Committee will also take up Proposal 132, which calls for increasing the Payment in Lieu of Taxes (PILOT) paid to the City by the sewer utility, floating bonds to the tune of $189 million backed by those PILOT payments, and floating bond anticipation notes to the tune of $189 million to be repaid by the bond proceeds within 5 years. I am concerned about how dedicated these funds will be and what will prohibit the funds from being spent on things other than infrastructure. SECTION 29. All PILOT received by the City shall be deposited in the consolidated county fund and used for any purpose that the consolidated county fund may be used. Throughout the Ordinance, there are references to "the Project", but nowhere can I find "the Project" defined. If the funds are not legally limited in how they can be spent, then, any and all normal expenses of the consolidated county fund would qualify. The sale of the utilities is being sold to the public as a way to fix our worn streets, sidewalks, and bridges. The ordinance needs to be as specific and ink down this promise. I remind everyone how former Mayor Bart Peterson raised the County Option Income Tax and promised that $5 million of it would go to crime prevention grants. When the Council and Mayor's office changed to Republican hands, that promise went out the window. The City of Indianapolis estimates that as many as 26,000 ADA ramps may be missing and need to be installed throughout the city. The estimated coat to install these missing ramps is $40 million dollars. Indianapolis has approximately 476 miles of alleys that provide access to adjacent residents, utilities, solid waste collection, as well as the general public. DPW staff estimates that as many as 50 percent of these alleys are below fair condition. The estimated cost to upgrade these alleys to fair condition is $65 million dollars. Our initial need is estimated to cost $39 million dollars. The alley segments in our inventory will be prioritized throughout the city by DPW staff working with the city county councilors. The City of Indianapolis has developed a bicycle plan for the installation of over 230 miles of on-street bicycle lanes and share the road segments to be incorporated over the next 15 years. The estimated cost to construct these bike lanes is $94 million dollars. Of the 531 bridges that are currently under Marion County' jurisdiction, approximately 151 of them are currently need some sort of the rehabilitations and approximately 110 of them are currently recommended for replacement. The estimated cost to replace and rehabilitate these bridges is estimated at $291 million dollars. Our initial need is estimated to cost $63.5 million dollars. DPW estimates that the City of Indianapolis currently has 2,966 miles of sidewalk in our public transportation network. DPW's sidewalk inventory which is a part of our pavement management inventory (updated in 2000) estimates 447 miles of our sidewalk's existing condition is less than fair. The estimated cost to reconstruct this existing sidewalk is $186 million. Our initial need is estimated to cost $52 million dollars. The street segments in our inventory will be prioritized throughout the city by DPW staff working with the city county councilors. With the upcoming Super Bowl in February 2012 there is an immediate need to implement a short term repair of the Monument Circle and its spokes. DPW estimates that the cost to rehabilitate all of the driving and walking surfaces with this area at $2 million dollars. The City of Indianapolis maintains 7,302 lane miles of pavement. DPW's pavement inventory estimates that 1,058 lane miles of pavement's condition (thoroughfares, and residential streets) is less than fair and is in the need of resurfacing or more extensive repairs. The estimated cost to resurface the street segments identified to be in less than a fair condition is $238 million dollars. The street segments in our inventory will be prioritized throughout the city by DPW staff working with the city county councilors. Of the 1100 traffic signals that are under Marion County's jurisdiction approximately 750 of them are currently or have been connected to some type of coordinated system. DPW estimates that the cost to repair the traffic signal system network and perform the necessary data collection and analysis to optimize our traffic signal network at $5 million dollars. I do not know if a tangential reference to the Public Works Board Resolution can result in limiting number of ways the bond and BAN proceeds can be spent and in effect dedicate those funds. The dollar costs listed in the Resolution add up to $585.5 million. So, even if the Resolution legally does limit the ways that the money can be spent, there still is a lot of wiggle room for spending $189 million in money (less the expense related to floating the BANs and bonds) on $585.5 million in needs. Hopefully, the Council committee will cinch down the legal issues of dedicating these funds tonight. But, the risk that the City's taxpayers could have to pay back $189 million plus interest on bond anticipation notes, should the IURC deny the rate increase, makes me very nervous.